I had a request for info on the tape measure on my longarm table in the side clamps photo. 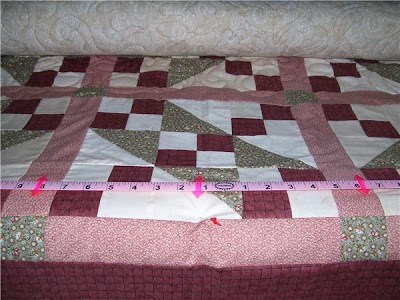 It is a centering tape for longarms (http://www.colonialneedle.com/) Love it! I do full floats, and this helps me keep the top aligned perfectly as I roll. As proof to Mary that I indeed was working today, these ladies were painting fabric for quilt backs. We had fun , and they went home with several beautiful, one of a kind pieces of fabric. Fabric dyeing and painting is another thing I love to do. I do much of the fabric in my quilts with various painting and dyeing techniques. There just isn't enough time to get all the things done I like to do! That's OK - I come how many miles and you can't drive over to see me??? Did you mean to post the same photo twice? or two different ones? Or is Keith's computer screen just so small I can't tell they are different?? We had a great evening at Craig and Mary's - it's good to see them. 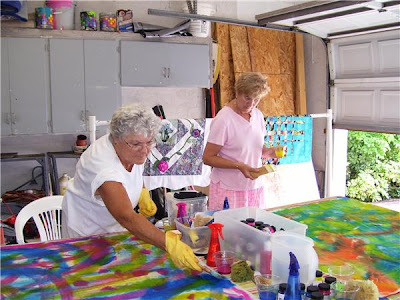 Fabric painting looks like fun! I could see me with more on myself than on the fabric I was painting. Saw your quilt at MQS in Overland Park. It was beautiful.